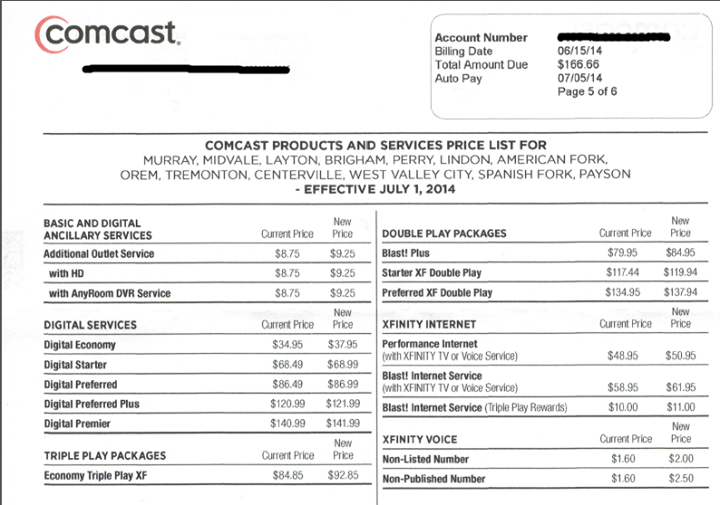 Comcast to customer in UTOPIA cities: “drop dead, here’s a rate hike” – Free UTOPIA! « The Legislature punts on new anti-UTOPIA bills, but for how long? Tagged Comcast, competition, rate hike, UTOPIA. Bookmark the permalink. I don’t believe Comcast locks anyone into a contract, even on discounts. In recent memory, I’ve never been locked into a contract on a discounted rate. I’ve gotten offers from them before that require a contract of one or two years to lock in a really low rate. I have zero doubts they’d do it again in an instant. It has been a while, but they used to do 1 year contracts. If they know you don’t have an option, why wouldn’t they do it again? Yet another reason the Macquarie deal needs to happen! Seems strange they would pick now for a change like this, or perhaps it was in the pipeline for a while and just hit now. Especially if the Macquarie deal happens. They are probably doing this because of the liklyhood that the Macquarie deal happens. If they can get residents that aren’t aware of the UTOPIA/Macquarie deal to sign a contract, it’s X years that they are locked into Comcast…Who knows, during that time Comcast might provide excellent customer service, and retain a customer. If there isn’t some underlying reason to lock people into a contract, all comcast is doing is guaranteeing that when customers have the option they will jump off the comcast ship without hesitation. Macquarie could just pull a T-Mobile and offer to pay ETFs if people switch. I think it’s more subtle than all that. They are raising their rates NOW, so that when Macquarie goes through, they can lower rates, like they did in Provo. Only instead of being a “real” rate reduction, it’s a “sale price” from an already elevated “base”. Just like a lot of stores do with their frequent shopper cards: they raised the “base” price so that with the “club card” you now pay the same price as you used to. Only now you feel like you got a “deal”. Even more sinister: they can actually “come clean” and admit that’s what they are doing, and use that as leverage against Macquarie. How? The Macquarie rep at the Payson meeting mentioned the provo price drops of over $50. He then proceeded to explain that yes, there will be a fee of around $20, but *even if* you don’t want the fiber plan and keep your cable or DSL, because of the rate reductions, you will actually save money. (He did a horrible job of explaining it; if he’d done a better job there, there might have been some hope of at least a 2-2 vote). So.. back to the leverage: you actually WON’T save money, see, because we raised the rates on purpose so we could drop them later without saving you money….and it’s all Macquarie’s fault. The worst kind of corporate slime. There’s a reason Comcast is the second least-liked company (how do say that intelligently “they are at the top of the list of the bottom feeders….”). And they are merging with the first… so Utah will have the #1 and #2 worst customer service companies delivering internet. And it won’t even be broadband internet, if the FCC has their way. Another thought I had was on customers calling in to find out why their rate went up. It would give Comcast an opportunity to ask the customer to tell their reps that they don’t want the macquarie deal, and in exchange their rates would go down. Glad to say that if that is the case when I ask my Comcast rep to lower my rate back to normal, I’ll say, “instead of asking them not to do it, I’m going to insist they finish the fiber, and bring competition to the market, because I now see what happens without it.”.